Large mailboxes Each user gets 50 GB of mailbox storage and can send messages up to 25 MB in size. Outlook support Users can connect supported versions of Outlook to Exchange Online. 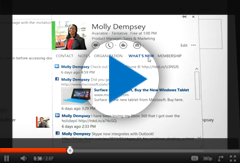 Web-based access For web-client access, Outlook Web App provides a premium browser-based experience. Mobility Mobile access is available from all phones that can receive email. Shared calendar and contacts Users can compare calendars to schedule meetings and can access collaboration features. Apps for Outlook Users can spend less time switching between apps with an extension model. Security Every mailbox is protected with premier anti-malware and anti-spam protection. Hosted voicemail Take advantage of hosted Unified Messaging services. Data loss prevention (DLP) Control sensitive business data with built-in DLP policies based on regulatory standards such as PII and PCI. that includes Office, SharePoint, and Lync. The following table compares the two standalone plans, or you can compare the Office 365 options. Options for individual professionals are also available. Click here for more information. Office 365 ProPlus is subscription service plan. It include Word, PowerPoint, Excel, Outlook, OneNote, Publisher, Access, and Lync instaled on your PC or laptop computer. Office 365 ProPlus is a user-based service that allows people to access Office experiences on up to 5 PCs or Macs and on their mobile devices.